We here at the Main Street Gazette have always been, and will continue to be, very vocal about our favorite dishes from our favorite restaurants. Sometimes, however, we overlook the other options available when we allow our stomachs to zero in on one particular meal. With that in mind, and with continual reminders, we stepped away from the egg rolls and chicken fried rice of Yak and Yeti Local Foods Cafe in an attempt to broaden our appetite. 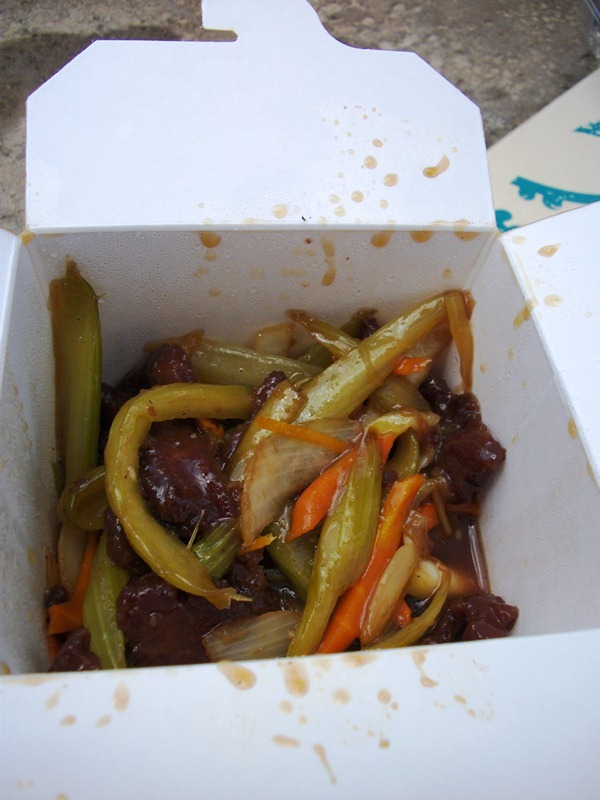 The Orange Beef, like all main entrees from Yak & Yeti Local Foods Cafe, comes in tall box container. The bottom portion of the take out carton is filled with steamed rice. On top of the white rice is a concoction meat, vegetables and sauce. 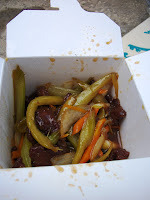 In the case of the Orange Beef, the meat is obviously beef, the veggies include carrots, celery and onions, and the sauce is a slightly spicy number. In order to not devour all of the good stuff first and be left with the starchy rice as the final bites of your meal, the components must be mixed together. This must be done slowly, unless you would like a good portion of your meal to end up on the table, or worse yet, on you. The white rice was, to my tastes, a little too over steamed, making the rice a little mushier than I would have preferred. The vegetables were good, slightly chewy, but still with enough snap to add character to the dish. While I could see guests wanting more meat in their Orange Beef, it amount of slice beef appeared to add to the balance of entrée, not overwhelm it. As for the heat level of the meal, while I would have preferred something with a bit more kick, the Orange Beef would likely fall in that introductory range where your mouth starts to warm up, but you’ve not yet broken out into a sweat. Overall, this is a perfectly fine lunch or dinner option from Yak & Yeti Local Foods Cafe. It is not going to set your world, or mouth, on fire, but it will fill you up. Though, if you’re in Asia looking for a good meal, my recommendation will always fall back to the two pork egg rolls and a serving of chicken fried rice from the same establishment. But that’s just this reporters opinion. This place has the best egg rolls on property; in my opinion.